When it comes to luxury crossover SUVs, the BMW X5 is the standard-bearer in terms of handling and performance. It has all the features of a practical vehicle as well as the comfort and flare of a luxury vehicle. With seating for 5 and the standard 5 door layout you can easily enjoy all the amazing features that this chic car has to offer. 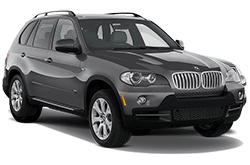 Athletic handling, smooth powertrains, luxurious and comfortable interior, a huge list of features, wonderful mileage, and advanced safety features all make the BMW X5 a great choice for your car rental needs! Check it out for yourself today and drive away in style and comfort as the BMW X5 is quickly becoming a popular choice for many!